The question I get the most is, “how did you get started with this catering company?”. I’ve always felt like when you cook for others, you are inviting them in to know a little bit more about you; a little bit more than most others know. My cooking style related to the use of ingredients, simplicity, and presentation have evolved over the last few years (compare this dish posted with “awesome dinner…awesome night” post) but the one thing that has remained consistent is the obvious passion that goes into it. Coming from a family that loved to cook, the desire to entertain was instilled in me. It was only when I moved in with two of my closest friends (Sam Mapp and Dave Brown) that this desire truly surfaced. First out of necessity, and soon thereafter out of enjoyment I started cooking the three of us dinner. For the next two years we ate 95% of our dinners together, at the kitchen table. I cooked, they critiqued and then we all cleaned. One day, we decided that we should invite a number of our friends over for a dinner party to let them in on one of our dinners. This was the main course I served to the 11 people crammed in at our kitchen table. As we ate, you couldn’t help but get swept over by the excitement and comfort; nothing better than close friends sitting around a table eating a homecooked meal, and drinking some great wine. So there it is, the answer to that ever repeating question….thats how I got started. This dish is named after the street that we lived on, Doten Ave. Chicken Dotena is a pan roasted chicken breast topped with sauteed spinach and red pepper covered in Fontina Cheese. 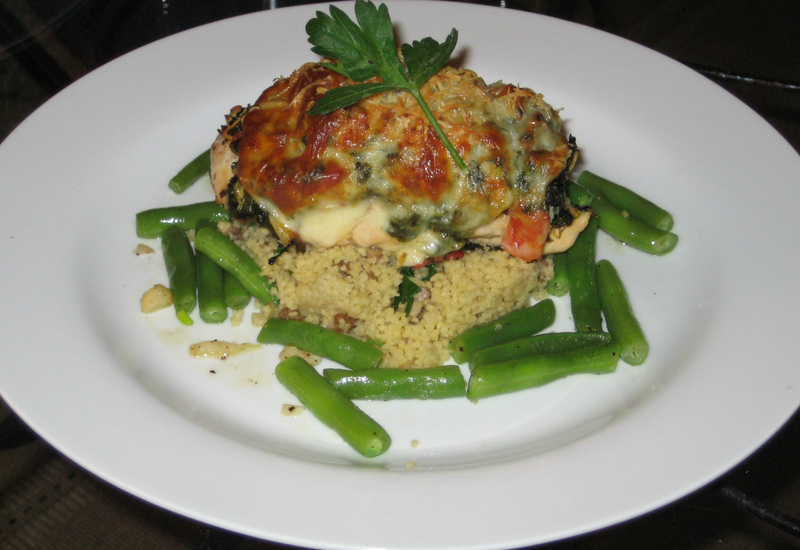 It was served with roasted string beans and wild mushroom couscous. As you can see, my portion control and presentation have come along way…but hey you have to start somewhere.